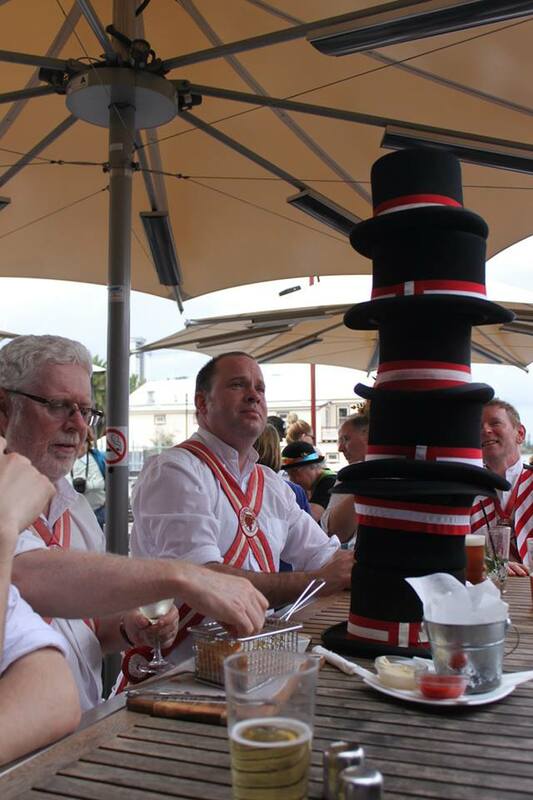 Perth Airport’s Dome Cafe played host to an impromptu meet and greet of Morris persons, including the AMM, one Saturday early in September 2014, en route to Perth MM’s 40th Anniversary Ale. 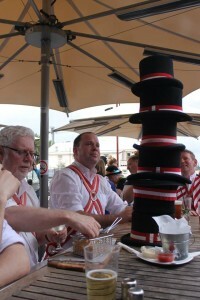 It’s easy to pick the morris men when they wear their toppers to travel. Deposited by bus at the Broadwaters Resort at Como, the dispersal of sides through the various rooms, as orchestrated by PMM, quickly dispatched any reserve between them. 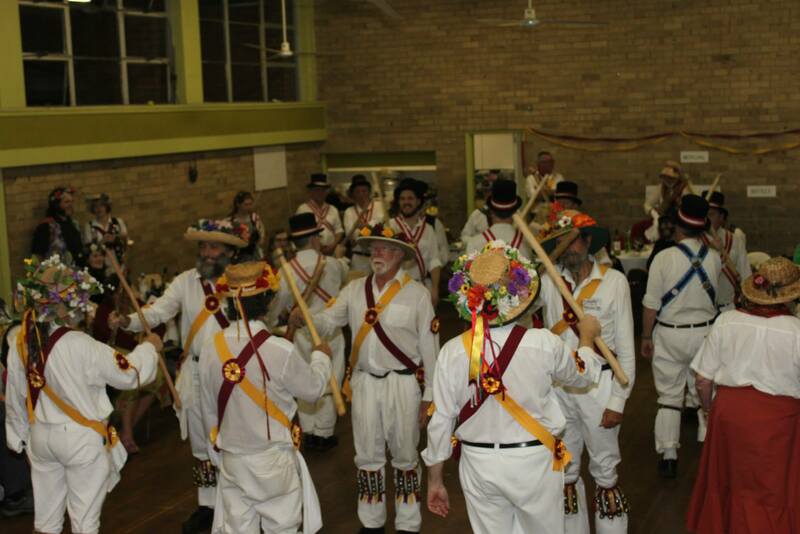 After settling in for a few hours at Como the Moon and Sixpence pub then hosted the official Friday meet and greet. With Hobgoblin on tap the evening was the first of a series of great pub encounters over the next six days. Later at Como party spirit was displayed by those off to the local pub, and probably good sense displayed by those who were not. Saturday morning was dancing at Forrest Place, a city square where dancing alternated with light rain and an audience. 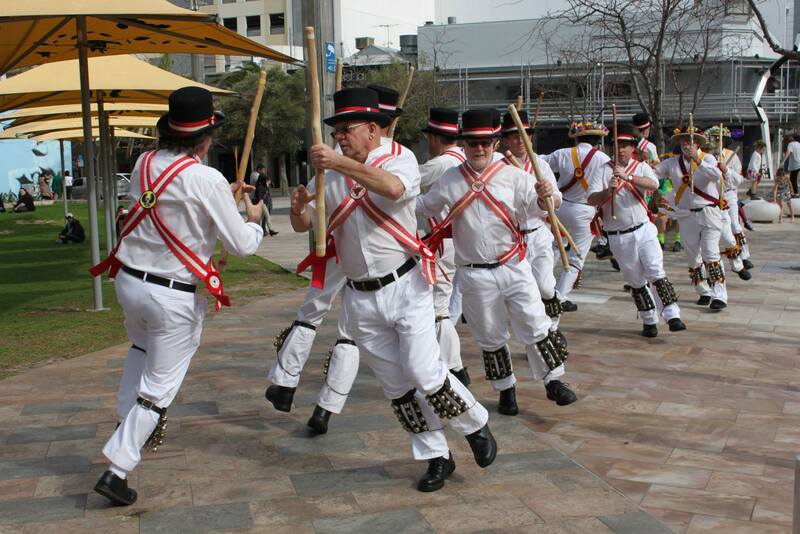 Some walked and some bussed to the Northbridge Brewing Company premises for lunch and further dancing in the park adjacent. 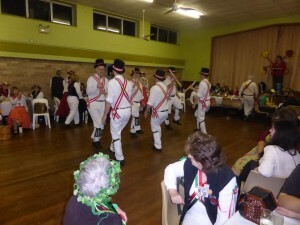 A break back at Como and we were off that evening for the ale proper at St Patrick’s Hall, Mount Lawley, a slap-up meal, a variety of dancing and entertainment including limericks of varying taste and freshness. Finally back to Como for post-ale pursuits including bed, conversation or a box session and dancing at the wet end of a Swan River pier in a minor gale. Sunday morning was a BBQ breakfast and dance on the banks of the Swan, an idyllic location with a view of the city, then a bus trip along the river to “The Lucky Shag”, named for the waterbird rather than the sexual aspirations of (morris) men. A pleasant afternoon of drinking, dining and dancing then back to Como where a large party opted for the Chinese restaurant option for a windy evening which concluded with polite conversation on the balcony in the now gale-force winds off the Swan. 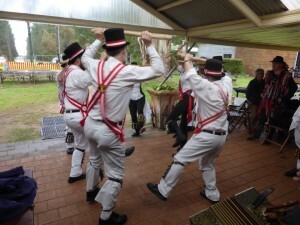 The Monday 8:30 start had a few people rubbing eyes and nursing heads while waiting in the damp cool outside for the bus trip to Margaret River’s “Morris Mansion”. While the atmosphere in the bus was usually lively, when Black Joak sang the bus was strangely quiet. 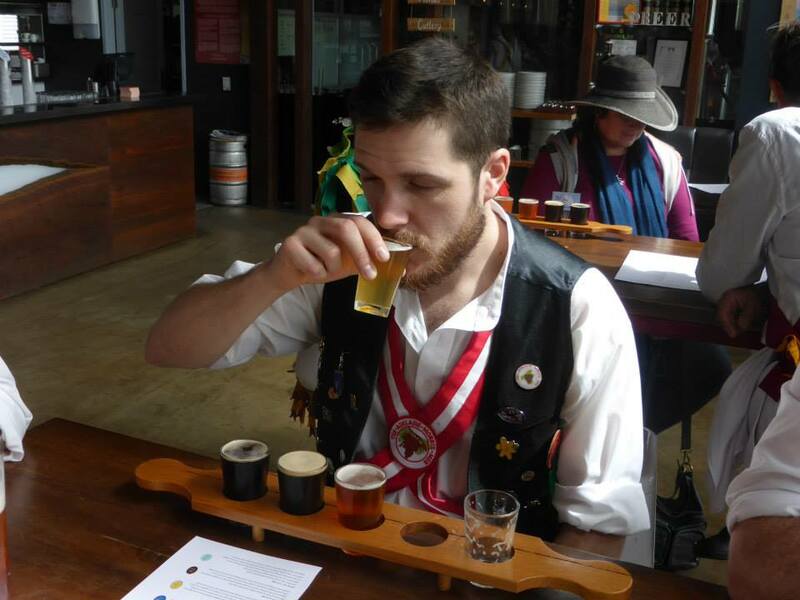 That day and the next we danced and drank at Margaret River township and in local breweries ranging from bush construction on a shoestring to art architecture on carbon fibre tendons. It was noted that beer quality didn’t correlate with venue construction. Terry and Ann played graceful host to some 42 persons and their shenanigans for this time. On Wednesday we returned via bus to Perth for connection to our various transports home. 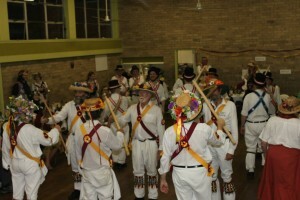 Kudos to Perth Morris Men for a successful and rewarding ale.